Inspired by Dracula's journey by sea to Whitby in Bram Stoker's classic novel, writer Robert Forrest gives us his version of the events onboard the Demeter before she finally runs aground on the English coast. Designed to scare its audience in the manner of 'Alien' as the crew are picked off one by one, the fear factor is multiplied by being staged as a promenade performance on board a genuine 'Tall Ship' at Glasgow's quayside. Quantifying the 'scare factor' is a tricky thing to do, as everyone has different 'buttons' to be pressed, so your mileage may vary. Although there are perhaps only one or two moments which made me jump (and it would benefit from a few more), it certainly created an unsettling atmosphere. Let's just say that there was no rush to be the first to follow our characters down staircases into the darkness. But then, fear, and particularly fear of the supernatural, is only part of what's important here. Just as significant is the effect the perceived threat has on the relationships between the crew. And while Forrest's writing isn't exactly subtle in making the connection with the current climate of fear in our society, it's a parallel well worth highlighting. The cast of two, Simon Donaldson and Stuart Bowman, give fantastic performances. Each portrays several of the ship's crew and give the relationships between them a real sense of depth - genuine affection between some; fear and suspicion between others. While they do well to make each character distinct in voice and mannerisms, a little more help by way of props/costumes wouldn't have gone amiss. Director Douglas Irvine employs handheld video cameras relaying images to strategically placed TV screens at times to give a crew's/monster's eye view of events. While it works well technically, for me the mere presence of the technology often broke the 'spell'. The show is at its most magical when it's at its most low-tech, and perhaps had the 'monster' remained as noises/voices in the darkness our imagination would have made it all the more terrifying. We saw an early performance of the show*, and we suspect as the run continues it will be tweaked and polished into a unique and memorable piece of theatre. *This was a performance for an audience of bloggers and social media users which we think was a great idea - although in keeping with our usual policy, we insisted on paying for our tickets. 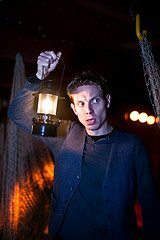 Visible Fictions' Curse of the Demeter runs at Glasgow's Tall Ship on various dates until 20th November. Image by Neil Thomas Douglas used with permission.